Here's the short answer; Now you can get the viewer id of a user loading your page and send it back to your server in a trusted way. Before (up to two weeks ago, when I last tried it) it was only possible to send back info from the web page in an untrusted way. What I mean by that is that you could load a custom opensocial gadget, which got the viewer id using the opensocial api, and then proceeded to use the opensocial makeRequest() call to route that information back to an url on your server. However, since this information orgiginated in the browser, potentially someone might somehow get a malign script to run on your page (from an ad, perhaps) and make up any old id, to then send back to your server. In the opensocial specification, there is different modes of makeRequest, of which one is to make a signed request. To describe a signed request, I've drawn a small diagram above. Let's walk through it, and return to the signed request in a little while. Let's say that you have copied in some Google Friend Connect gadgets on one of your pages, by registering your site with GFC, noting your sites code, and so on, the first thing that happens is that a person going to you site loads your page (1). In your page lies the gfc gadget references, which load the gadgets themselves from the GFC proxy servers (I call them proxies since much of what they do is route information back and forth third parties) (2). If this is the first time the users has been to the site and/or the user have not 'joined' the site on a GC sense, he/she may now proceed to do so (still (2)). 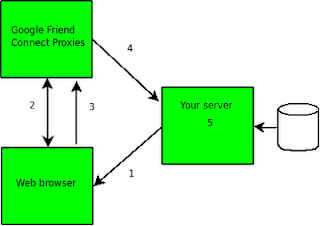 This will send the data (viewer id) first to the gfc proxies(3), which will then route it forward to your server (4). On your server is a special script that parses the post data out from the HTTP request (5). Numbers and other stuff are messed with a bit, due to posting :) But the thing is that two weeks ago, only the two POST lines were getting though, and any signed request returned and error in th browser. This is the dawn of maybe not a new era, but a new eralischimo. Now you can use trusted user ids without having to manage the users, changing password, creating capthcas (and keeping up with the bots), listing friends and manage those connections, et.c. Now you just slam a gadget on the page, and get an id back you can trust. Not half bad eh? Including how to generate x.509 certs from scratch on Windows and Linux (Maybe mac as well).